Front: Matthias Williams, Katrinah Carol Lewis, Jasmine Eileen Coles, Jerold Solomon, and Trezana Beverley (seated). Photo by Aaron Sutten. 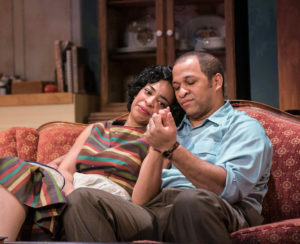 The opening scene of A Raisin in the Sun sets the tone for universal relatability as Ruth and Walter Younger (Katrinah Carol Lewis and Jerold E. Solomon) awaken. Their morning vocal rituals – repeated throat clearings, tired coughs, and a flurry of must-get-moving sighs – feel authentic. When Walter explodes at Ruth’s gentle nudging to get ready for a job he is clearly not enamored of, the tension in their marriage pops up like another character in their dark, cramped Chicago apartment. Katrinah Carol Lewis and Jerold Solomon. Photo by Aaron Sutten. That moment brilliantly sets the stage for this landmark play about the racially tinged struggles of a family desperate to escape a Chicago slum in the late forties. Lorraine Hansberry – the first black woman to have had a play produced on Broadway – penned this work more than fifty years ago, yet it feels timely in the current environment where racial issues dominate and divide us. Under the crisp direction of Tawnya Pettiford-Wates, this strong ensemble conveys the struggles of a grandmother longing for better opportunities for her children and grandchild; a wife dealing with the strain of an unfulfilled husband and unexpected development; a husband/father/son longing to be an entrepreneur; a daughter/sister studying to become a doctor; a child wanting to play outside and sleep in his own bed in his own room instead of on the living room couch. Bru Ajueyitsi and Jasmine Coles. Photo by Aaron Sutten. The play centers around Walter, whose DNA lacks his father’s grit and resilience. Solomon aptly portrays a man longing for his own business so deeply that he becomes a flim-flam magnet, much to the heartbreak of his long-suffering wife and loving but domineering mother, played by the amazing Trezana Beverley. The chilling emotional climax belongs to the awesome Tony-award winning Beverley. After her son squanders the legacy of her husband, who literally worked himself to death, she suspends time with a layered performance that is a privilege to experience. 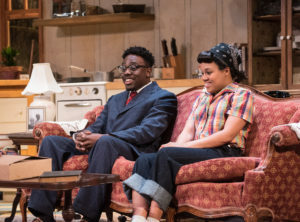 Other standouts include Lewis, whose body language as Walter’s forbearing wife speaks volumes without dialogue; Jasmine Eileen Coles, who convincingly plays the spirited Beneatha Younger; and Bru Ajueyitsi, who makes his Virginia Rep debut as Nigerian suitor Joseph Asagai. Coles, especially, brings a spirit of levity to the stage as her character explores African roots and the concept of assimilationism. Trezana Beverley and Jerold Solomon. Photo by Aaron Sutten. Kudos also to the well-executed lighting, which smartly conveys the passage of time on a solidly designed set built entirely around the Younger’s living room and kitchen. 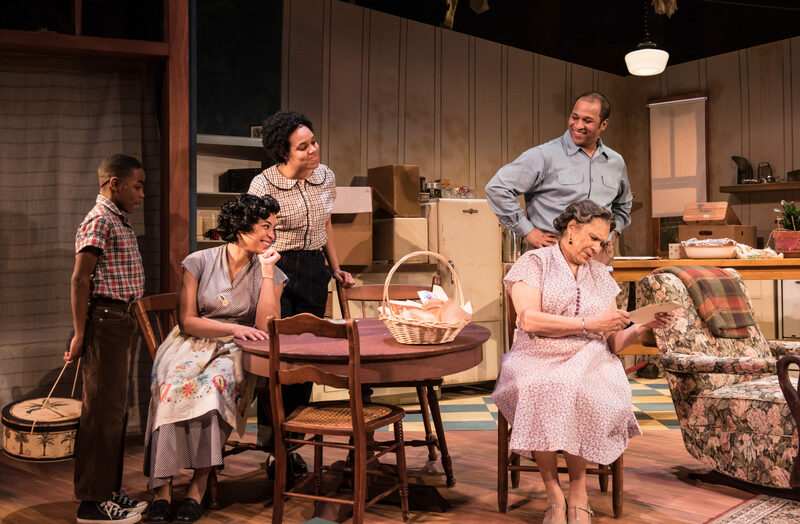 At a time when many African Americans fear that the nation’s attitudes about race are divisive or regressive, and the American Dream increasingly illusory, this play about dreamers forced to take dead-end jobs just to stay afloat feels as fresh as ever. It’s a family drama about aspirations that connects with several generations. You should note that some of the themes are mature and derogatory language is used. Talking about one’s dreams and ways to achieve them, however, is always a conversation worth having. Taking the kids? A Raisin in the Sun is recommended for seventh grade and up. 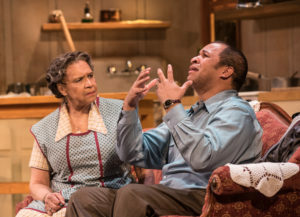 A Raisin in the Sun runs through March 11 at November Theatre. For showtimes and tickets, go here.